Quick Results: Keith 13th (261), James 14th (258), Rob 19th (250), Tony 25th (179). With all AGB cards accounted for the trio set off in convoy with Keith bravely leading the way. The journey itself was smooth and largely uneventful passing through some beautiful sussex countryside. Until the last 5 minutes. Keith’s sat-nav decided that it wanted to either shown him some lovely properties that were for sale or destroy someone’s garden fence to get to the parking area where they were heading. No one’s quite sure which. Luckily google maps saved the day and James lead the convoy to the car park without driving through any fences. The trio had arrived with plenty of time to spare and found their way to the sign in desk which was in its own little hall. Which gave: Keith plenty of time to remember to put everything on his bow; James’s bow plenty of time to defrost from the ice cube it had become overnight and Rob a chance to check that his feathers hadn’t fallen off from the emergency work the previous night. With 5 minutes to go the trio became concerned as Tony hadn’t appeared and no one had been seen exiting the hall from the previous session. Only when asked did we get told that the entrance was on the other side of the building and they were going to be starting shortly! The trio rushed around in a controlled panic and entered the hall to be greeted by the beaming face of Tony and Peter, (Who had entered the competition separately). With the team finally all together and all in the right place, the competition got underway. All of the Crawley archers were on the same detail and on targets next to each other. This combined with having practiced the round on the Wednesday set the team with a positive attitude. That and Rob had bought JELLYBABIES!! (James got quite excited.) For Keith and James the first half got off to a good start with the two archers staying level throughout! Unfortunately Rob had attached his side rods on the wrong way which was messing with his groups and left him unsettled. When asked how he was doing at the half way, Tony replied saying he was doing cool. Whether that was a statement on the temperature of the hall, which was becoming colder, or he was doing alright. No-one was quite sure. For the final half the lead in the team kept swing between James and Keith but tiredness was starting to take its effect. Rob meanwhile had relaxed and the switch flipped putting in tight groups and consistently putting in ends of 24. The rest of the round passed without incident coming to the end as it does, meaning everyone could go warm up! Each had their own places to be, and knew that no medals were to be had today. So the team said their goodbyes to the other competitors and each other. Overall the team was pleased with their performance and left confident for future competitions ahead! 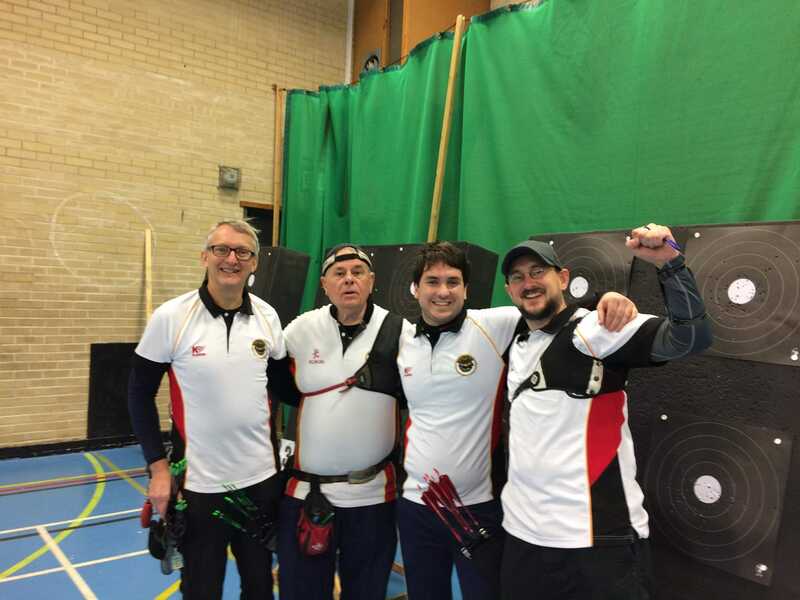 Fancy joining our archers at a shoot? head over to the Tournaments Page to find out how!